As a mother of six kids I’ve learned the importance of waiting well. Waiting for them to put on their shoes, waiting for them to find their shoes, waiting for rooms to be cleaned and homework to be finished. But most of all waiting for them to become the people God created them to be. That wait is the hardest of all. I was reminded of that a few years ago when my oldest daughter broke a cabinet door. Of course, her younger sister got blamed. I stabbed my finger at the broken door. “Did you do that?” It was a good guess that Jayna was the culprit, even though she had four other siblings. Of the all the things broken in the house, Jayna had caused 95% of them. We didn’t call her ‘little monkey’ for nothing. So, when something turned up broken, Jayna was the first one I called. I frowned. “Are you sure?” It had been a long time since Jayna’s nine-year-old sister had done anything like break a cabinet door. I picked up the broken door and walked into the other room where Bethany was practicing piano. “Do you know how this got broken?” I waved the piece in her direction. “Did you do it?” Doubt edged my voice. Bethany didn’t say a word. The next day, Bethany came to me with a red face. She started to cry. “I broke the cabinet door. It wasn’t Jayna, it was me.” Between sniffles, she explained how she sat on the door just like we’d told her not to do, and it broke, and she lied, and, and, and . . . and she didn’t want to get in trouble. About three minutes into her big confession, I was trying to not grin. Not because I was happy that the door was broken, but because I was starting to see that waiting instead of continuing to accuse had born fruit. The Holy Spirit had worked in my waiting and helped Bethany become more of the young woman he had created her to be. Sometimes, as a parent, you just have to wait. Kids make mistakes. They don’t learn as quickly as we hope. They don’t change as fast as we pray. Often, the hardest work we do is wait for God to work in the lives and hearts of our kids. For me, three things have helped me to learn to wait well with my kids. The first is to not bring up past mistakes but instead to recognize the progress they’ve made thus far in an area. In the wait for Jayna to become less of a monkey, I hadn’t recognized her progress. She had been getting better with her toys and not breaking them. But when I discovered something broken, I remembered her past antics and accused her. Waiting well means focusing on progress and not on prior failures. Another thing that helps is writing down specific prayers for the character development of my kids and noting in the same journal any movement toward those prayers being answered. I don’t write down the setbacks, only the positive steps toward them becoming more like the people God wants them to be. I write character-prayers, such as for Bethany to become an even more truth-loving person or Jayna to become more responsibility-oriented. I don’t write task-oriented prayers that have to do with actions such as cleaning up after themselves, or taking care of their shoes, or being on time. These prayers help me stay focused on what matters most to God and to me, that my kids grow in Christ-likeness. The most important thing, however, I’ve learned for waiting well is the art of keeping my mouth shut. It’s easy to keep talking and talking and talking in hopes that my kids will finally “get it” and do what they should or be who they should be. Harder is to wait in silence after instruction or advice has been given and yet change has not yet happened. Lamentations 3:26 (NIV) says, “It is good to wait quietly for the salvation of the LORD.” As parents, we must work to wait quietly for God to work in our kids. We must recognize when we’ve already said everything that needs to be said and our job is to wait and watch and pray. Our kids must have a chance to grow and mature, to figure out how to make good decisions, wise decisions, on their own. That wait is the most difficult, and the most beautiful. 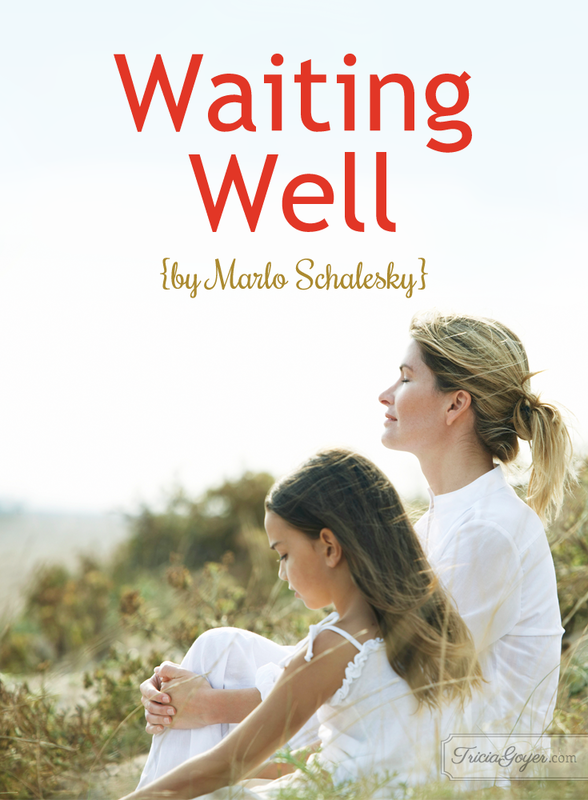 In the end, learning to wait well with our kids is simply learning to imitate God. He doesn’t bring up our past mistakes. He focuses much more on who we are in him than what we do for him. He waits, patiently, quietly, to give us a chance to respond to the Holy Spirit in faith. So, in all the late mornings and lost shoes, in the frustrations of slow change and problems that keep recurring, in all the waiting rooms of life, look to Jesus, who shows us the wonder of waiting well. 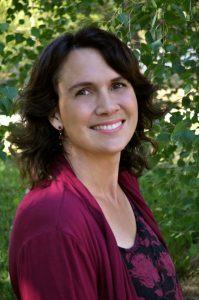 Marlo Schalesky is an award-winning author of both fiction and non-fiction whose articles have been published in many Christian magazines. 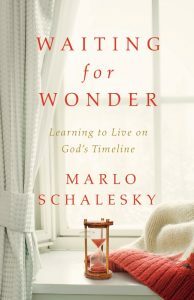 Her latest release is Waiting for Wonder: Learning to Live on God’s Timetable (Abingdon Press). She is the founder and president of Wonder Wood Ranch, a California charitable organization bringing hope to a hurting community through horses. Schalesky lives with her husband, six children and a crazy number of animals at her log-home ranch on California’s central coast. Learn more about Marlo Schalesky by visiting www.VividGod.com, following her on Facebook (MarloSchalesky) or via Twitter (@marloschalesky).